The Royal Philharmonic Society is a British music society, formed in 1813. It was originally formed in London to promote performances of instrumental music there. Many distinguished composers and performers have taken part in its concerts. It is now a membership society, and while it no longer has its own orchestra, it continues a wide-ranging programme of activities which focus on composers and young musicians and aim to engage audiences so that future generations will enjoy a rich and vibrant musical life. Since 1989 it has promoted the annual Royal Philharmonic Society Music Awards for live music-making in the United Kingdom. The RPS is a registered UK charity No. 213693. It is located at 48 Great Marlborough Street in London. Antal Doráti, was a Hungarian-born conductor and composer who became a naturalized American citizen in 1943. 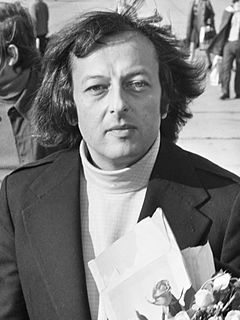 André George Previn, was a German-American pianist, composer, arranger, and conductor. The Royal Festival Hall is a 2,900-seat concert, dance and talks venue within Southbank Centre in London. It is situated on the South Bank of the River Thames, not far from Hungerford Bridge, in the London Borough of Lambeth. It is a Grade I listed building, the first post-war building to become so protected. The London Philharmonic Orchestra, the Philharmonia Orchestra and the Orchestra of the Age of Enlightenment are resident in the hall. Harry Walter Legge was an English classical record producer, most especially associated with EMI. His recordings include many sets later regarded as classics and reissued by EMI as "Great Recordings of the Century". He worked in the recording industry from 1927, combining this with the post of junior music critic of The Manchester Guardian. He was assistant to Sir Thomas Beecham at the Royal Opera House, Covent Garden, and in World War II played a role in bringing music to the armed forces and civilians. In 1987 the RPO established a sister ensemble, the Royal Philharmonic Concert Orchestra, which plays lighter classics. It succeeded a similar group, the Royal Philharmonic Pops Orchestra.  . In 1989, the RPO recorded the flamenco album "Soy Gitano" (I am a gipsy man) with Camarón de la Isla. The London Royal Philarmonic Orchestra accompanied Fairuz in both of her London Gran Hall Olympia concerts on March 11 th and 12 th 1994, along with Lebanese chorists, and other Lebanese musicians who played arab music instruments such as 'Oud and Qanun. The concerts' arrangements were by Fairuz son Ziad Rahbany, Lebanese author, musician, composer, and arranger. ↑ "Press reviews", Royal Philharmonic Orchestra, accessed 3 June 2013. ↑ "RPO Records", Orchid Classics, accessed 4 June 2013. ↑ Widran, Jonathan, "Yanni / Live at the Acropolis / review" (WebCite archive), AllMusic, 1994 or later. Sir Adrian Cedric Boult, CH was an English conductor. Brought up in a prosperous mercantile family, he followed musical studies in England and at Leipzig, Germany, with early conducting work in London for the Royal Opera House and Sergei Diaghilev's ballet company. His first prominent post was conductor of the City of Birmingham Orchestra in 1924. When the British Broadcasting Corporation appointed him director of music in 1930, he established the BBC Symphony Orchestra and became its chief conductor. The orchestra set standards of excellence that were rivalled in Britain only by the London Philharmonic Orchestra (LPO), founded two years later. John (Jack) Alexander Brymer OBE was an English clarinettist. The Times called him "the leading clarinettist of his generation, perhaps of the century". He was largely self-taught as a player, and he performed as an amateur before being invited by Sir Thomas Beecham to join the Royal Philharmonic Orchestra in 1947. He remained with the orchestra until 1963, two years after Beecham's death. Reginald Clifford Kell was an English clarinettist. He was noted especially for his career as a soloist and chamber music player. He was the principal clarinettist in leading British orchestras, including the London Philharmonic, Philharmonia, and Royal Philharmonic, and was also active as a solo recording artist. Norman René Del Mar CBE was a British conductor, horn player, and biographer. As a conductor, he specialized in the music of late romantic composers; including Edward Elgar, Gustav Mahler, and Richard Strauss. He left a great legacy of recordings of British music, in particular Elgar, Ralph Vaughan Williams, Frederick Delius, and Benjamin Britten. He notably conducted the premiere recording of Britten's children's opera Noye's Fludde. Geoffrey Winzer Gilbert was an English flautist, who was a leading influence on British flute-playing, introducing a more flexible style, based on French techniques, with metal instruments replacing the traditional wood. He was a prominent member of five British symphony orchestras between 1930 and 1961, and in 1948 he founded a chamber ensemble of leading wind players. Love in Bath is an orchestral suite, with one vocal number, arranged in 1945 from the music of George Frideric Handel by the conductor Sir Thomas Beecham for a projected ballet entitled The Great Elopement. It was the last of six suites of Handel's music arranged by Beecham from 1924 onwards. Sea Drift is among the larger-scale musical works by the composer Frederick Delius. Completed in 1903-1904 and first performed in 1906, it is a setting for baritone, chorus and orchestra of words by Walt Whitman. Massimo Filippo Antongiulio Maria Freccia was an Italian American conductor. He had an international reputation but never held a post as music director of a major orchestra or opera house. Unusually for an Italian, he built his career around symphonic music rather than opera. For several years he was an assistant to Arturo Toscanini, whom he venerated, and he was regularly invited by Toscanini to conduct the NBC Symphony Orchestra. Songs of Sunset is a work by Frederick Delius, written in 1906-07, and scored for mezzo-soprano and baritone soli, SATB chorus and large orchestra. The words are by Ernest Dowson.